I spent some time last Sunday with the dead at Charleston’s Magnolia Cemetery. 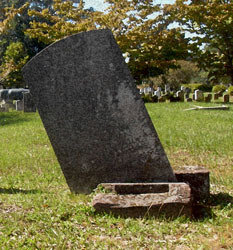 Their tombstones leaned left and right, backward and forward. Some had fallen over completely and were broken in half, allowing grass to grow right up through the middle where caretakers dutifully mowed it for the next hundred years. Maybe the caretakers could have taken the time to set these markers straight again, but people come to Magnolia because of the way things tilt and crack and crumble. The cemetery with its revolutionaries and Civil War veterans and myriad personal stories is a natural tourist destination, even if the caretakers don’t seem to know quite what to do with tourists. Arrows direct visitors down lanes marked No Trespassing. And there other restrictions not found in your typical graveyard. No Swimming. No Fishing. But most people don’t come to the cemetery to swim with their ancestors. They come for the atmosphere and the history. There is a Confederate soldier who survived being wounded in battle only to succumb to typhoid. There are three separate crews of the C.S.S. Hunley–the submarine that only went down. And there are countless stories of the individuals who came to South Carolina from every part of the world and shaped it into what we know today. It is easy, for a moment, to begin to feel that you are back in their world. But if you visit on a humid autumn day after a week of rain, there are also plenty of small striped mosquitoes that are only too willing to remind you that you are still flesh and blood.